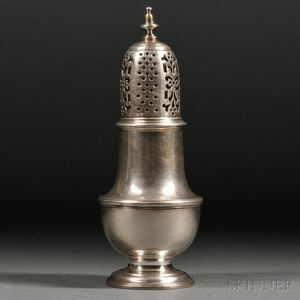 George II Sterling Silver Caster, London, 1747-48, Samuel Wood, maker, with pierced cover on a balustroid body, and circular foot, ht. 6 1/4 in., approx. 5.6 troy oz. Age-typical wear. Some metal fatigue to pierce work.